"But tell me, what sort of dolls do you like best? Small ones or big ones? Dolls dressed as babies or as adults? Ones made of fabric, wood, or..." "Just dolls to love please!" Wax at first glance doesn't seem to be a natural material for making dolls. For centuries it was only used for the making of candles and religious figures for Nativity Sets, but this art of modeling in wax eventually connected with doll making, especially before the advent of compositions and plastics. The vast majority of poured wax dolls were made between the late 1700s and 1900 . 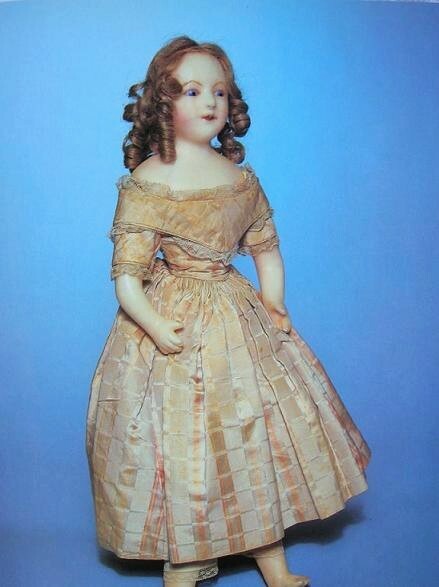 Wax modelers were commissioned to produce miniature children in imitation of Queen Victoria’s little princes and princesses. 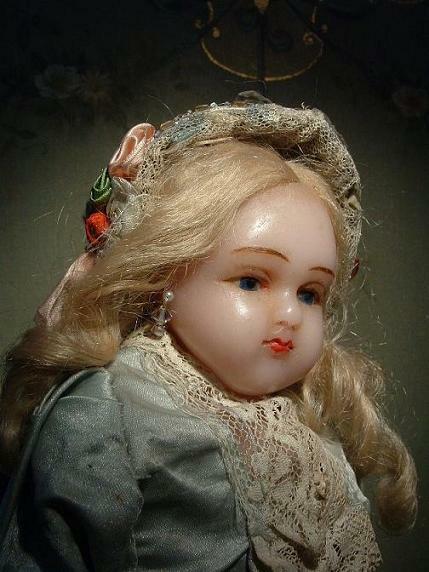 Wax is resilient and malleable, wax doll heads didn't smash to bits when dropped, like china or bisque dolls. Wax could also be tinted with beautiful and realistic skin tones. Finally, wax could be poured in molds. 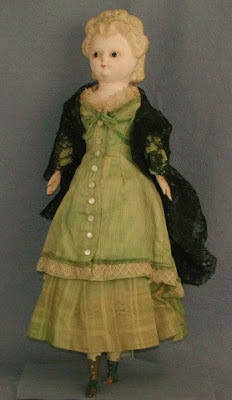 However, wax proved very fragile when subjected to temperature changes so it never became a main doll making material. 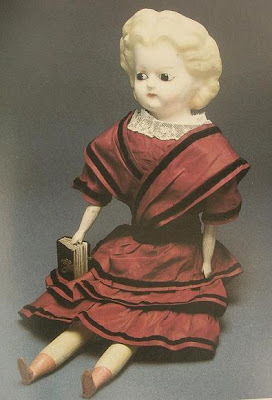 Poured Wax was very desirable for its translucence and how it resembled skin, by the end of the 18th century the quality of the beautiful turned, and carved dolls had deteriorated. 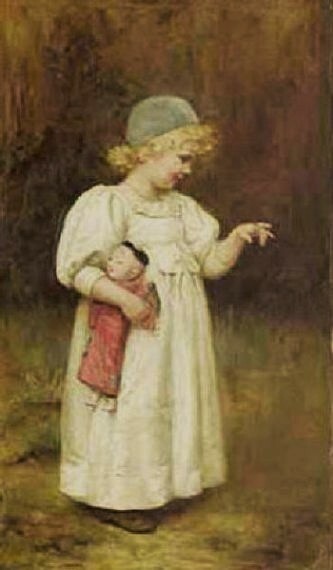 They were considered old fashion, and a more realistic baby was in demand. 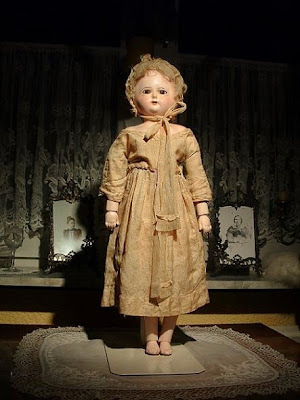 It is the waxworks of historic icons by wax modelers such as Montanari and Pierotti that the specialist art of the wax doll as a child’s plaything eventually evolved. 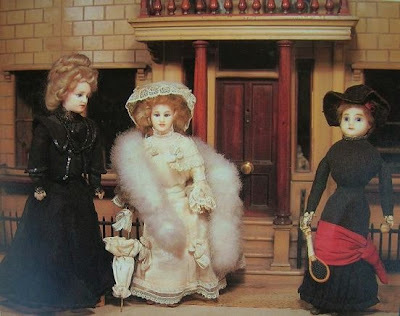 Three Wax Dolls from the Powell Collection housed at the Bethnal Green Museum of Childhood. Wax over Papier-Mache English dolls, Wenham Museum, Massachusetts. Where we find the egg shaped slit heads with the hair inserted through a slit down the middle. The hair is then parted and drawn to each side, they have fixed, pupiless glass eyes. 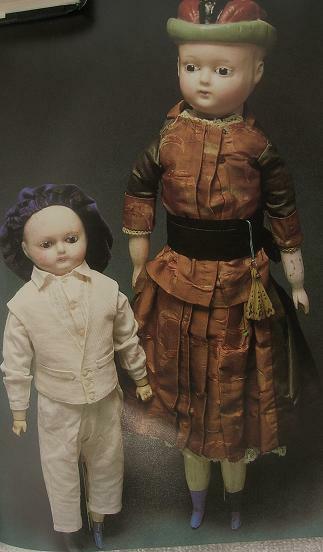 These dolls apparently came in about 1820, and as a rule, their leather hands had only three fingers. 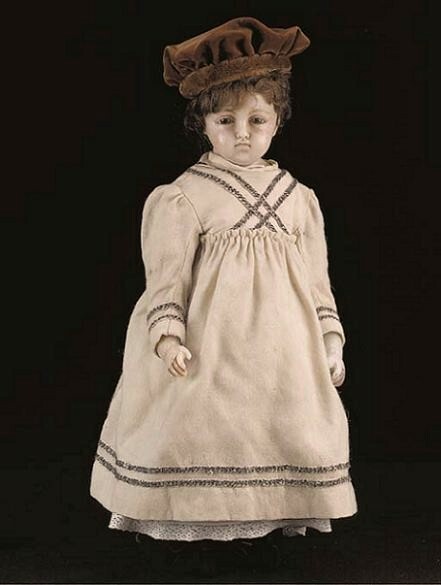 About 1825 came the wire-eyed wax type, the first of the dolls with sleeping-eyes. The eyes were dark, had no pupils, and were manipulated by a wire that came out at the side of the waist. This English wax over papier-mache is said to have belonged to the eldest daughter of Queen Victoria "Vicky" born in 1840. The doll dates back to 1845-1850. She has sleeping eyes and real hair. The dress is of preserved shot silk, striped tafetta type, with a V yoke. Although they might look ugly and decrepit to some, they hold a charm of their own to the collector, they are my personal favorites. To restore them would be to destroy. From 1840 to 1845 came the "Pumpkin-Head" or "Squash-Head" so called because of their round moon- like faces that are very narrow from back to front. The heads were so narrow, that they only required a two part shallow mold. The standard doll of this type has the hair arranged in a pompadour and molded on the head. Usually there was a black band, like a circular comb, around the top of the head, they had dark glass eyes which also had no pupils. The arms and legs were of wood and the bodies were usually stuffed with straw or hay. 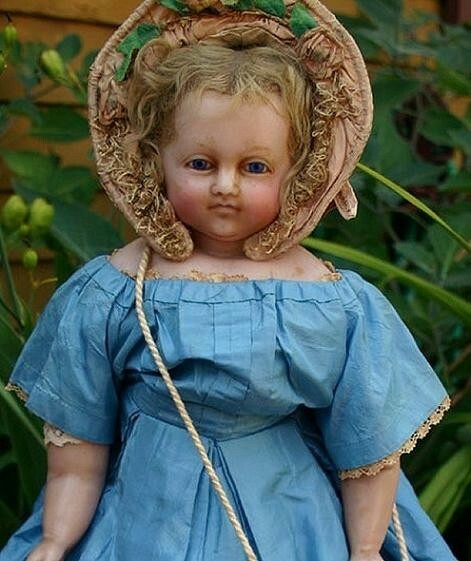 Is the primitive appearance of these dolls that collectors find so appealing, I have one in my collection that has a very serious, prim and proper expression, like a Victorian schoolmarm. Pumpkin Head with "Alice in Wonderland" hair style. 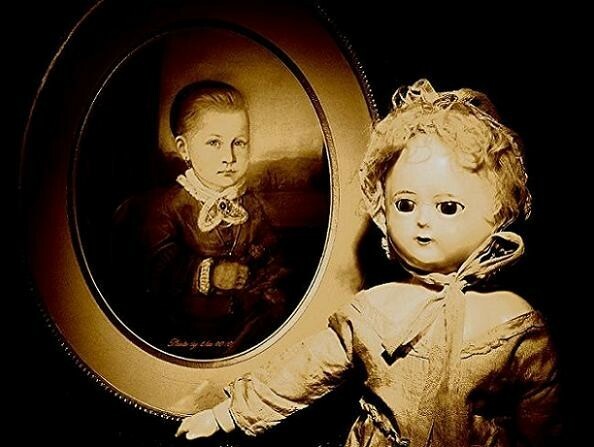 Although wax doll heads didn't completely shatter when dropped like china and bisque head dolls, they were still delicate. They were subjected to been crushed, scratched and nicked when dropped or in play, and the colors of their eyes, lip and other features could easily rub off. 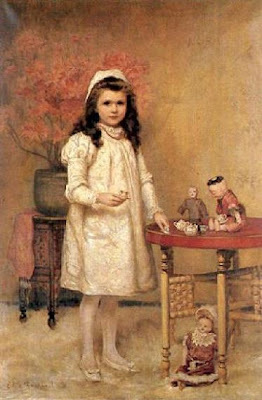 Original card stated that the doll belonged to Emma Gertrude (Way) Thayer (b. 1843) of Pulaski (Oswego Co.), NY, donor Gertrude (Thayer) Melendy's mother. Emma was born during August 1843, the daughter of Zara M. Way (1818-1860) and Esther Allison (b. 1822). During the 1860s Emma moved to Milwaukee where she married Orson Allertus Thayer (b.1845), a railroad conductor. He died in the 1870's. Emma married Adolphus W. Ingalsbe (b. 1822), a farmer, on November 24, 1880 and moved to Columbus, WI. 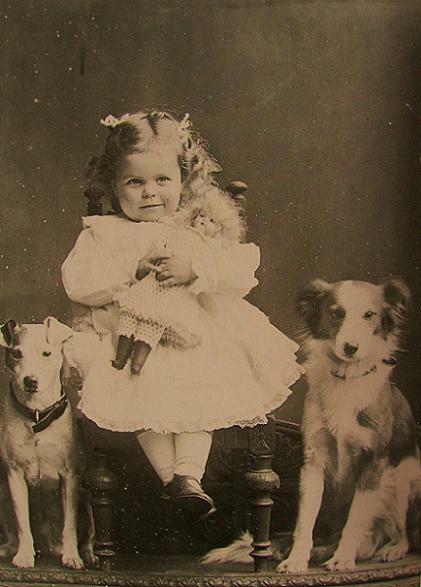 During the 1920s she moved to Lakewood, OH to live with her daughter. 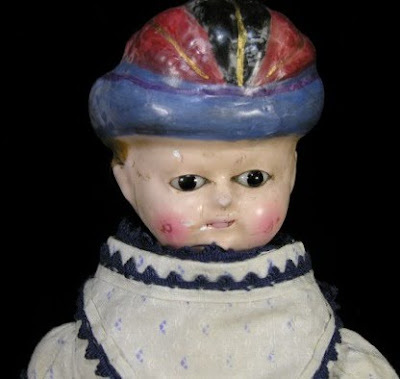 Bonnet Head dolls descended from the Pumpkin Head, most were made in small sizes and intended to be sold cheaply. Although tawdry in construction, they were interesting for the variety of the headgear. Some wear flat hats with a stiff feather, while others wear bonnets with quite an ornate design. All, of course, moulded in the wax. The bonnet heads are more desirable than the standard pumpkin head to collectors because they were made in a greater variety. Damage to wax dolls cannot be easily repaired, and because of this, any wax doll damage will have a serious effect on their value. Conversely, wax dolls that have fully retained their original skin tone, feature color, with surfaces without crazing or scratches, sell at high premiums. 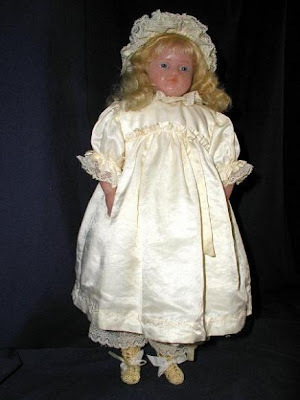 Because it is very difficult to permanently mark a wax doll, most dolls were only marked with paper labels, and so many of the early makers of these dolls have been lost to history. 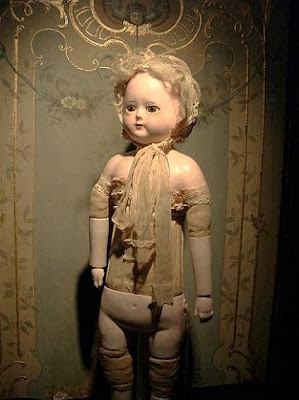 This type of baby doll was quite revolutionary, It is said that Charles Motschmann of Sonneberg, was so taken by the Japanese baby dolls he saw at the 1855 Paris Exposition that he worked at improving on the idea of a composition body with turned wooden limbs, and articulated floating joints attached to a cloth midsection in the torso. This allowed for a squeaker to be accommodated thus making the doll pliable and realistic. Many of the doll’s heads were made in Germany out of composition, wood, porcelain and papier- mache. They had bamboo teeth and painted hair. 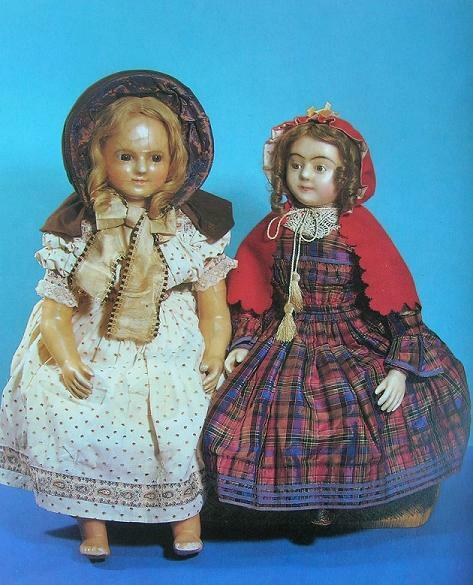 "Motschmann Dolls" Courtesy of Tikas Antique Toys and Dolls Corner. 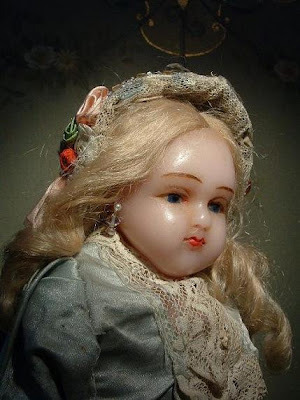 Wax over papier-mache doll, Germany ca. 1860. Mobile eyes made of cobalt blue glass. The chest contains a voice mechanism worked with cords. Motschmann Baby from my collection. Wax over papier-mache with fixed blue glass eyes. Original outfit ca. mid 1800's German. 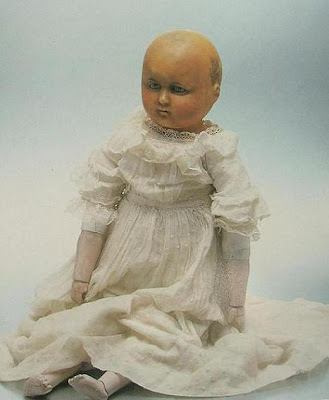 Motschmann dolls represent a young child, something not seen before. Previously, ladylike figures were the only type worth producing. This fact was an important advance in doll history. Whereas before, children were considered miniature adults, now childhood was beginning to be appreciated as interesting in itself. 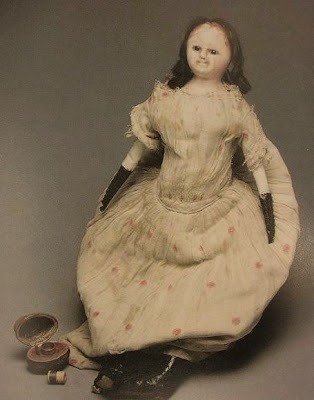 By the end of the 19th century other methods of doll making were established, fine quality bisque creations superseded the old fashioned wax doll. 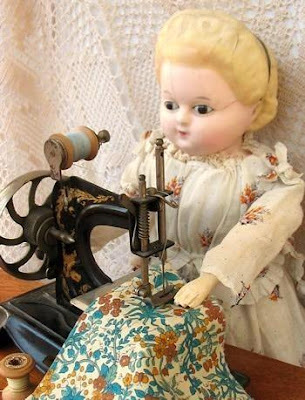 The last of the wax doll maker had to use their skills in a variety of ways by making tailor’s dummies, or coiffure heads for hair dressers in order to earn a living. Only now in modern times has there been some sort of renaissance of the wax doll. It is no longer for children however, but is a partnership established between collectors and skilled modelers who can restore antiques, and emulate the work of the past by making new models the old way. Absolutely fascinating. Spent ages reading this as it was new to me. What a great post. Thank you so much for all the kind comments!These very sweet old girls are my favorites. What an amazing post once again Marta, thankyou! I too am partial to wax dolls, mostly due to their striking resemblance to humans. It has been a pleasure to meet you here.I am more than happy to read and learn so many things.I will keep on visiting your Blog.Great Post. Thank you Tika for visiting and your sweet comment; and many thanks for letting me borrow your dolls. They are amazing! Muy especiales todas las muñecas de este post!!! Me gusta particularmente la foto de la niña entre los dos perros, tiene cara de estarse quieta a la fuerza. Con tu permiso me la guardo para un dia convertir a esa niña en muñeca. All your posts are always fascinating, Marta. Siempre me sorprende que estas muñecas (relíquias!) se conserven tan fantásticamente bien, después de tanto tiempo. ¡Tan delicadas y en ese estado! Es triste pensar en cuantas se habrán destruido. Muchas gracias por tus posts. ¡Siento no ser más puntual! Very educational for me. I have always loved the look of the wax dolls. 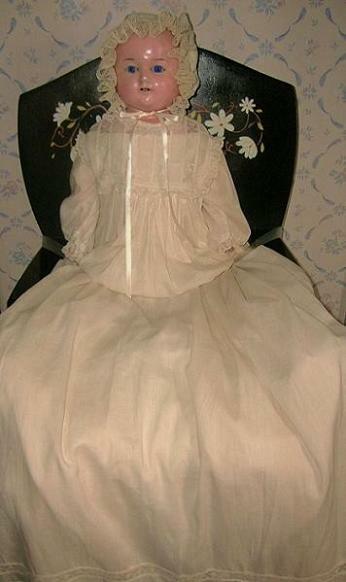 Some people think antique dolls are creepy looking, I think they are beautiful. Gracias por compartir tus conocimientos, son fantasticas todas las muñecas. Thank you for all the beautiful comments, I appreciate it so much! Gracias Gema...Que alegria saber de ti! Gracias por tu comentario Eli....las muñecas antiguas y su historia es mi pasion...Asi como la historia antigua me es fascinante. Me alegra mucho hayas encontrado mi blog. i love your dolls. i just came across 2 dolls grandma and grandpa wax molded. hand paintes hair is very intriqite. i was told they are from the 18th century. and have original clothing. i would love to know more about them. Hi and thank yo for your comment... Wax dolls were rarely marked, some had labels that with time fell off the wax. Montanari, Meech and Pierotti were the stars of wax modeling and as some of the examples here they were the finest in craftmanship, altough there were many cottage industries at the time that also made these dolls. 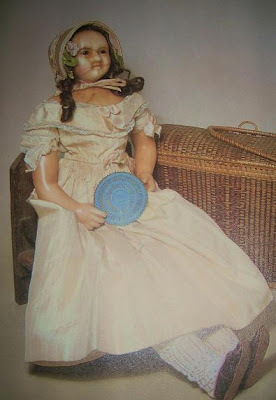 I am only a doll collector and my knowledge comes from researching my own dolls. There are books on Wax Dolls you can check; For example..."The History of Wax Dolls by Max Hillier," It is very informative. I am a descendent of H J Meech and am trying to find out more about him and his doll making.If anyone can help I would be truly grateful! 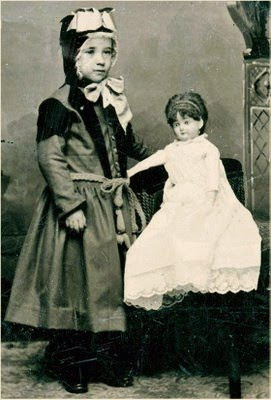 Does anyone know how his dolls came to be in America- were they exported to a particular shop, for example? They were mostly made in small premises in London so it wasn't a big concern. He once worked for Madam Tussaud, which I guess is where he learned the art of working with wax. He sometimes described himself as a modellor of wax figures as well as dolls, so his work may have been sold to tailors for dummies to display their clothes, for example. I hope someone out there can help? Hi Ros....What an honor to meet a descendant of Herbert John Meech....! As I mentioned on another comment the book by Mary Hillier "The History of Wax Dolls" is full of information, there is a whole chapter on the Meech family, including a family tree...There are also pictures of some of his dolls. As how the dolls came to this country, I am guessing with immigrants that settled here. I wish you the best of luck on your research and thank you for reading my blog.